So I made salmon this week. As one might expect, I used a recipe I found in Cooking Light. Yeah, I’m predictable. This BBQ Roasted Salmon was another one of the Top 25. The dry rub sounded a little, uh, interesting, but I will willing to go with it. 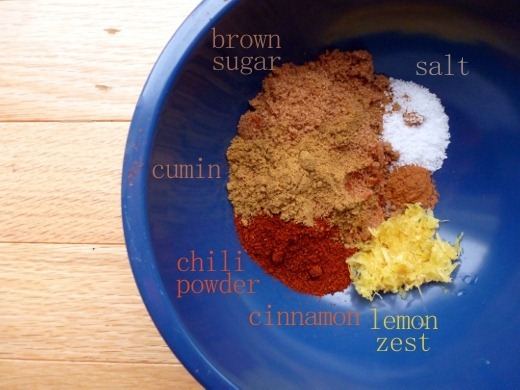 Cinnamon, lemon, and chili powder, eh? Sounds weird. Turns out, it was a leeetle bit weird to me. But let me tell you about the method, because I think it is a method I will continue to use when preparing salmon! An hour prior to roasting the salmon, I let it marinate in a plastic bag with fresh lemon and canned pineapple juice. Don’t let it go for more than an hour though, or you’ll end up with a ceviche on your hands. To prepare the salmon for baking, I removed it from the citrus marinade, placed it atop pineapple rings, coated the tops of the filets with the dry rub, and then baked for about 12 minutes. 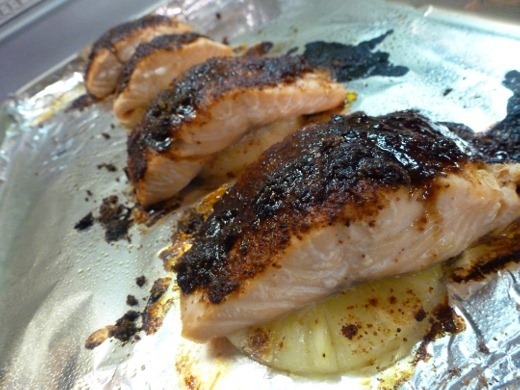 While I wouldn’t use this particular dry rub concoction again, I loved the zippy flavor and tender texture created by marinating the salmon in citrus juice for an hour before baking. Nope, it’s not burnt! That’s just the chili powder. 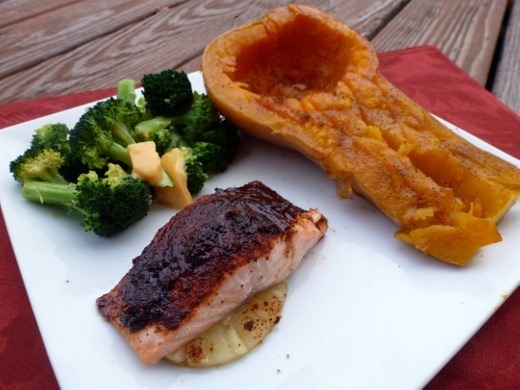 Served with my favorite seasonal side – butternut squash! <3 I can’t get enough of it! Typically my go-to salmon marinade is a combination of Honey, Ginger, and Soy, but I think in future I may simple try this lemon and pineapple juice marinade method, followed by a basic salt and pepper seasoning. Pingback: Meal Planning for the Week of November 3 – 9 « Meg.Goes.Nom.Nom.